No-bake blackberry cheesecake bars from Summer’s delicious bounty. Yum! Don’t turn on the oven. Enjoy this creamy, cold refreshment! Last night, my husband, Dave and I took a walk, bowls in hand. We strolled down our driveway. Blackberries bushes form an impenetrable hedge down the sides of that long lane. I’m pretty sure blackberries have a mission to take over the world. At least our world. 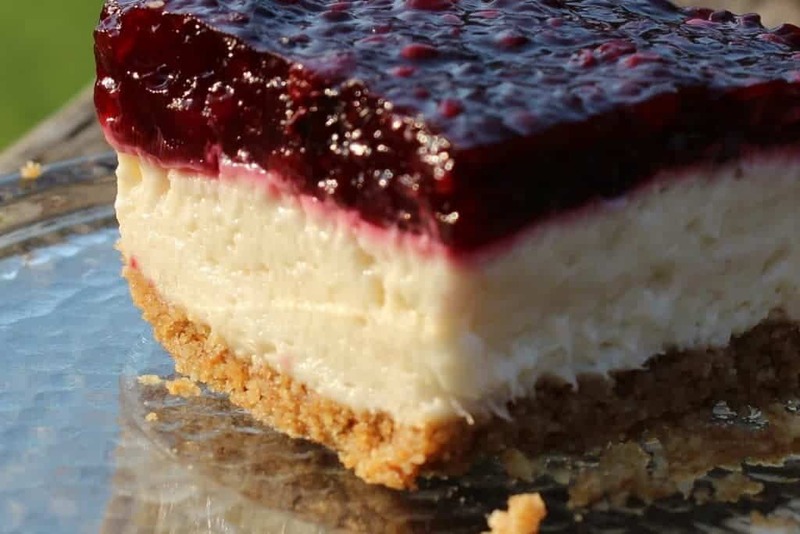 This easy No bake cheesecake recipe is one of the reasons we love those prickly brambles anyway. Remember the old saying of when you have lemons make lemonade? Well same applies here. Blackberries are a PAIN to manage. They REALLY love our property. 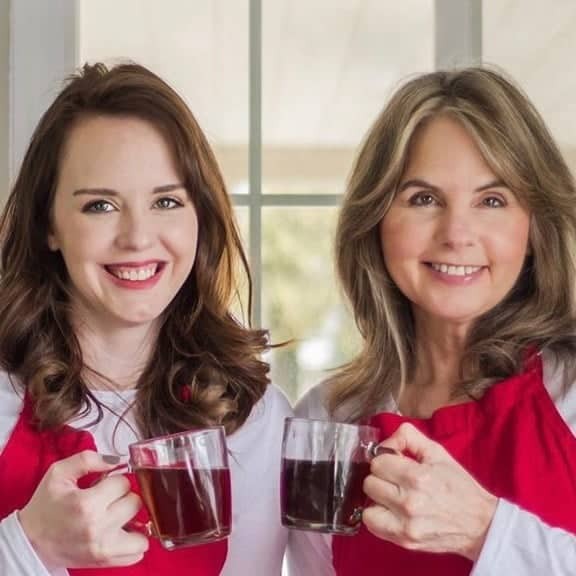 But you can do ENDLESS recipes with them! 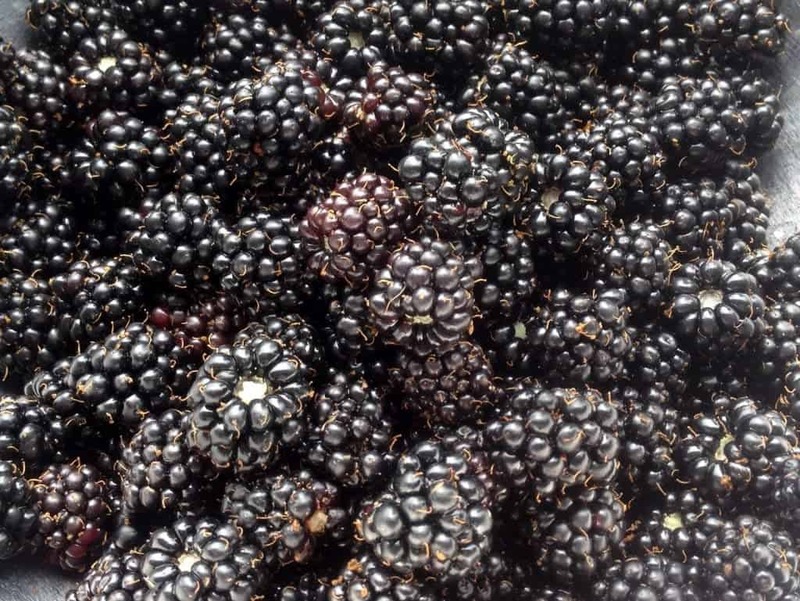 Blackberry pie, Blackberry cobbler and sugar free blackberry cheesecake Cups are a few reasons we pick blackberries every summer. I freeze gallons up for winter blackberry recipes. Nothing like blackberries in winter! blackberries from our many vines! Blackberries are SO good for you! Blackberries provide excellent health benefits. They are Amazingly good for you. Go here to check out the health benefits of these beneficial fruits. In summary, they are incredible allies against alzheimer’s and cancer according to recent research. All bramble berries are excellent for your health. However, Blackberries have the highest level of cancer fighting antioxidants of all berries. So what’s a few thorns? Go find some blackberries bushes! I’ve been doing a lot of recipes with blackberries this season. If you have blackberries and want some different recipes try our Blackberry Coconut oil Crumble Bars, and Blackberry Barbecue sauce . 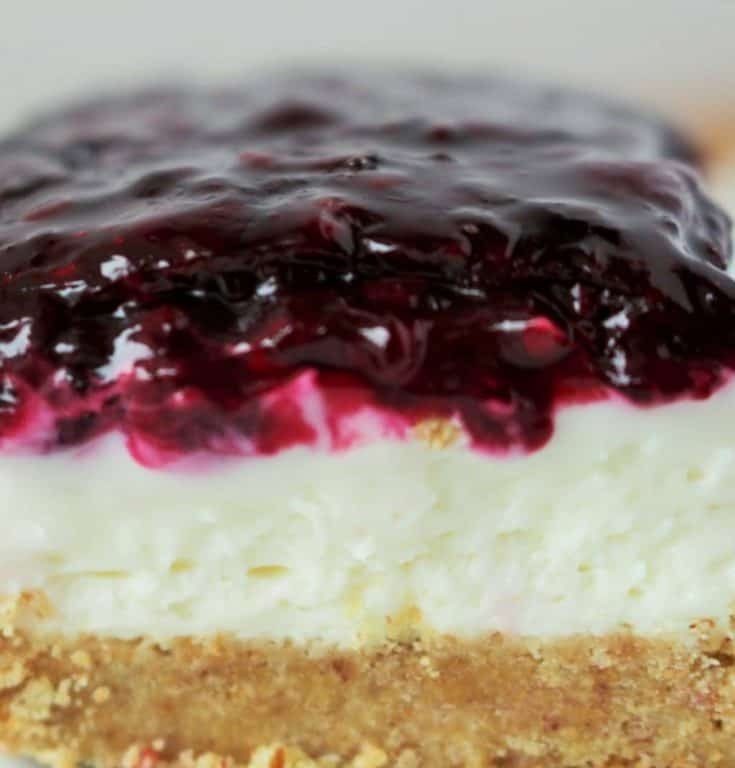 Recipe Update: I have made this delicious recipe for blackberry cheesecake bars several times now. I needed a yummy potluck dessert recently. I pulled a bag of frozen blackberries out of the freezer and whipped up a batch. This easy blackberry cheesecake recipe also has instructions for using frozen berries. Everybody loves this refreshing dessert! You can substitute the topping with other berry sauces if you want to play with new version of this dessert. Homemade raspberry sauce and blueberry sauce sweetened with maple syrup make great toppings. Just add more cornstarch if you want the topping thicker. Coconut oil is EXCELLENT in these bars, and for your health. It’s a great butter and oil replacement for every baked good I have used it in. The coconut oil adds a nice flavor component we really enjoy. 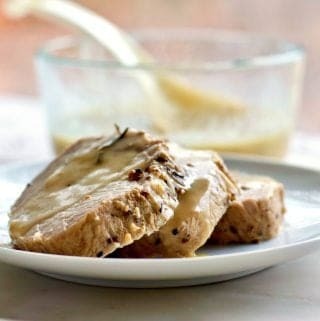 If your not a fan you can use butter one to one in this recipe. Use flavorless avocado oil for a heart healthy oil replacement for the saturated fats. Greek Yogurt makes a nice substitution for the sour cream if your looking to cut fat out of this recipe. feel free to substitute Neufchatel Cheese for the cream cheese to further cut bake on fat and calories. Use a sugar substitute to replace the sugar in this dessert to lower the carbs and calories. If you need gluten free or low carb check out the crust in our sugar free pumpkin cheesecake. It’s delicious, low carb and gluten free. The graham cracker crust it totally interchangeable. NOTES: It’s best to let this homemade blackberry cheesecake chill several hours in the fridge to set properly. However, what I did last night was serve it in cups. My family never waits for cool down time. One piece set up correctly. I defended it so you can see what these no bake cheesecake bars are supposed to look like. With less cornstarch the topping is more like a thick sauce. The picture at the bottom of the post shows the stiffer set. They both taste delicious and everybody liked both versions. It’s more about how you like them to look. The stiffer ones are a bit easier to cut cleanly. The looser topping has a less chewy texture. So now you can do what you like. Just remember the softer look is what you’ll get from the recipe as written. Use parchment paper in the bottom of your pan for easy removal. For best results use room temperature cream cheese. You CAN use it straight from the fridge if your whipping it up in a food processor. Otherwise room temperature cream cheese is much easier to work with. put 1 cup of heavy whipping cream in a separate bowl. whip it semi stiff peaks. Add 1 Tablespoon sugar or maple syrup to sweeten it. Dollop it on at serving time as desired. No bake Blackberry Cheesecake Bars. This is a stiffer set in the topping. If you prefer this jelly like topping. Add in more cornstarch into the topping. Put the blackberries, water and sugar into a 2 quart pot. Stir often. Bring to a boil. While the blackberries are heating put the cornstarch in a small cup and add 2 tablespoons water. mix well. Add the cornstarch to the berries and stir until thickened. Remove from heat and set in the fridge or freezer to cool until needed. Pulse the graham crackers with the walnuts, in a food processor until they make crumbs. Pour the coconut oil in a stream into the crumbs and pulse until it's well mixed. Combine the cream cheese, sour cream, vanilla and sugar and beat on low speed until mixed. Mix with an electric mixer until the mixture is perfectly smooth and blended. Pour the filling over the crust and smooth it into an even layer. Pour the cooled blackberries over the cream cheese layer. I love it, a true “farm to table” experience. These Blackberry Cheesecake Bars look amazing! Oh my word these look great! I adore blackberries! These are a favorite at every party I’ve taken them to, Debi. Thanks so much for stopping by! I have lots of blackberries in my house in Italy, I love to eat them when they are still green ! 🙂 This cheesecake looks amazing! Elena you have try this dessert! It’s easy, tasty and uses up those lovely, fresh blackberries! You are so lucky to have these fruits growing in your yard! This is a totally decadent and delicious dessert! We feel lucky at harvest time. Not so much when we are battling them back from taking over our property! I am completely jealous of your harvest. When we were young, we had a blackberry tree and it was so awesome. We would get great blackberries and just eat them right of the tree. Thank you Rini. We have a love hate relationship going with our blackberries. I think they have a plot to take over our world. But we do love to eat them by the mega tons! I wish we had blackberry bushes around. It sounds like so much fun to go pick them. These bars look wonderful! I’m so envious of your home grown blackberries. You’ve done them proud in this delish recipe! Oh yes, this does look delicious. I enjoyed your meandering to pick the blackberries. It brought back a childhood memory of the summers spent in the “country” with my great grandmother and picking the blackberries with my cousins. I’ll definitely be trying your “no bake” recipe, I know we’ll enjoy it. Thank you, Joanne. I’m glad you enjoyed the post. I hope you love this recipe as much as we do. I’ve made it several times and it always disappears quickly! This treat looks almost too good to share photos without passing some around! Lovely job here! Thank you Dan. This is a family favorite. We really LOVE this no bake dessert! Blackberries are so underrated! these look divine. They are SO good and healthy Justine! I love blackberries and I love a no-bake dessert, I have to try this, it looks amazing. You will love it Janette!